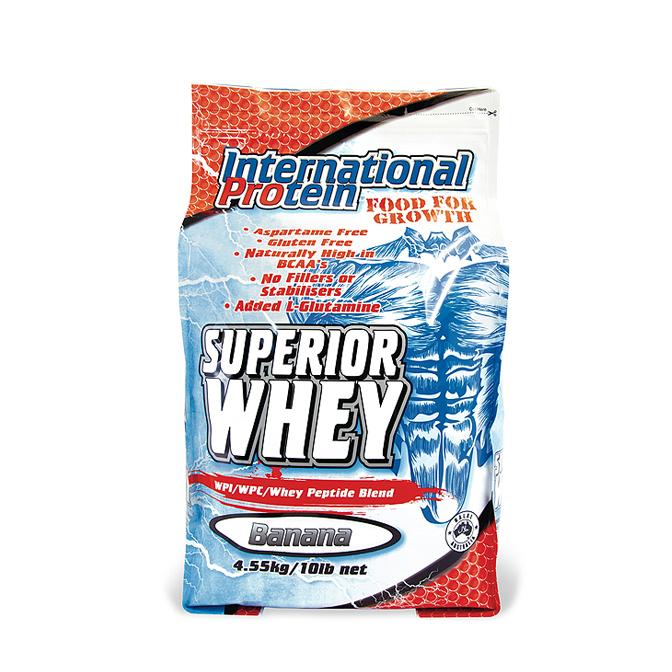 International Protein’s delicious Superior Whey is a high protein, low fat supplement packed with Whey Protein Isolate, Whey Protein Concentrate and Whey peptides which are perfect for those wanting lean muscle gains. Whey protein isolate the purest whey available with the least amount of fats and lactose to enhance protein synthesis. Whey protein concentrates act as powerful anti-oxidants and enhance muscle growth. Whey peptides are easier to digest and provide rapid absorption for rapid recovery. Superior whet is a high quality protein which facilitates rapid and efficient absorption. It contains no vegetables gun or soy proteins, so it won’t leave you feeling bloated. Along with protein, Superior Whey also comes with L-glutamine to boost immunity and BCCA’s to help with preserving muscle. These help to increase muscle recovery after a hard workout or exercise. Superior Whey contain no aspartame and is sweetened with sucralose for a delicious taste. 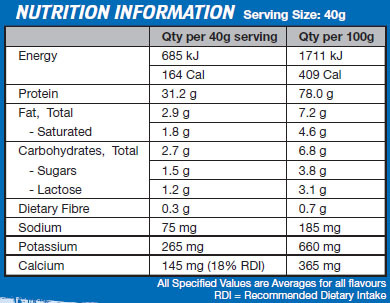 This product also contains no fillers or stabilisers, just high quality easily digestible protein. This fast absorbing protein supplement has no added sugar or preservatives and is gluten free making it great for digestion and absorption. Each serving carries 31.2g of protein and only under 3g of carbohydrates and fat making it just that more efficient for muscle building. Whey Protein: is a rich source of all the essential amino acids required by the body for many biological processes in muscular development. Whey proteins are high in Branch chain amino acids which help enhance muscle recovery when required. Whey proteins enhance immune function, burns fat, improve insulin sensitivity and decreases appetite. This product contains three types of proteins which all have their own important functions and absorption rates. These proteins are known as Whey protein isolate, Whey protein Concentrate and Whey Peptides. Whey Protein Isolate: contains a higher percentage of pure protein than other types of whey protein known as whey concentrate and whey hydrolysate. Whey proteins are highly bioavailable and are rapidly absorbable and contain a high concentration of amino acids. Whey Protein Isolate is commonly used today because its rapidly digestives and converts the body from a catabolic state back to an anabolic state. Whey Protein Concentrate: It is a complete protein which contains all 20 amino acids and contains small amounts of fats and carbohydrates. Whey protein concentrate keeps you feeling full for longer and is slow digesting. It has some major benefits on the body including increased synthesis of antioxidants, assists with weight loss, promotes lean muscle mass and enhances the function of the immune system. Whey Peptides: Are powerful isolates of amino acids derived from longer whole whey protein molecules. Whey peptides contain a wide range of benefits including enhanced immunity, improve gastrointestinal health, increase rates of muscle growth, antioxidant properties, increased state of nitrogen utilization and improved endocrine hormone responses.